Since 1950, Hatco has been a leader in creating innovative ideas for the foodservice industry. Known for bold innovations in equipment that improves efficiency, reliability and profits. Products designed and built to handle the rugged demands of today’s foodservice operations. They are dedicated to exceptional customer service and producing quality engineered equipment offering maximum performance. From the corporate offices in Milwaukee, Wisconsin to the state-of-the-art manufacturing facility in Sturgeon Bay, WI, there is a pride in the employees and their workmanship. All Hatco equipment is produced with a commitment to quality and reliability by certified assemblers using Demand Flow Technology. This process uses a series of quality checks and tests to meet rigid performance standards for every product. 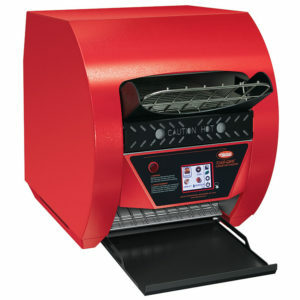 Hatco’s redesigned Toast-Qwik® Conveyor Toaster has a modernized, patent-pending design. Advanced controls guarantee the best flexibility and performance available. This toaster provides consistent uniform toasting, delivering up to 500 slices per hour. Includes a touchscreen control panel that allows implementation of up to 12 programmable product settings. Features a USB port that allows for easy transfer of product information, uploads of program changes and software updates. Power Save mode activates automatically after a certain period of time, or by pressing the power save button on the touchpad, to conserve energy. Available in Stainless Steel and Designer Warm Red (standard Designer Black) to match your décor.